Made of elegant heavy brocade fabric, this challah cover symbolizes the rest and that comes with the holy day of Shabbat. 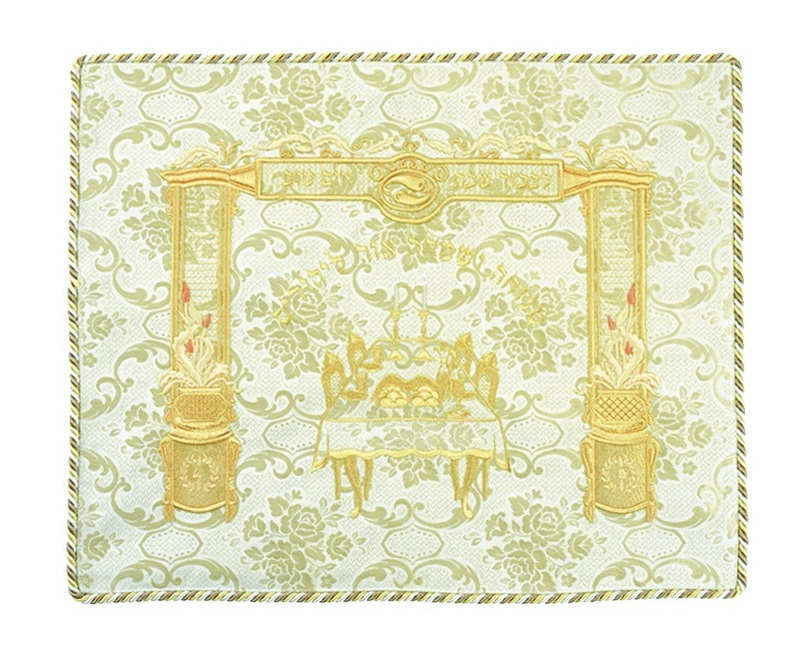 The challah cover depicts the joy and comfort of the Shabbat with a set Shabbat table and peaceful surroundings. The table is set between elegant beams with plants in the center. The beams support a banner that has the Hebrew words “Likavod Shabbat V’Yom Tov”, which means “In honor of Shabbat and Yom Tov”. Above the image of the set Shabbat table, the Hebrew words from the Shabbat zemirot which refer to the Shabbat day, “Menucha ve'simcha or la’yehudim”, which translates, “Rest and joy, a light for the Jews”. The edge of the challah cover is bordered by an elegant rope trimming.